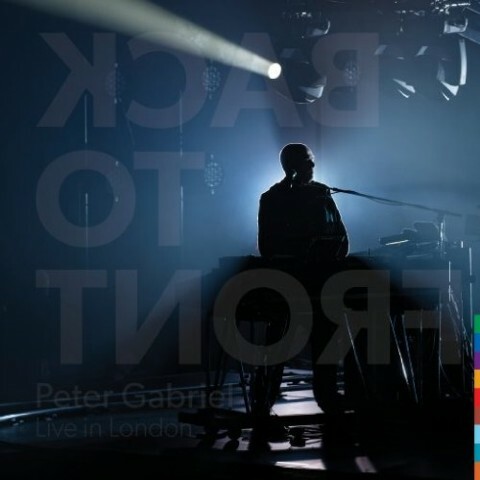 Peter Gabriel‘s S0-celebrating Back to Front tour was filmed at London’s O2 in October 2013 using the latest ultra high definition 4K technology. This concert film of this show is released on DVD and blu-ray in June 2014 with both formats available in standard and deluxe configurations. The normal editions are standard one-disc affairs, but it gets more interesting with the deluxe editions which come packaged as 60-page photo-books and are four-discs sets. 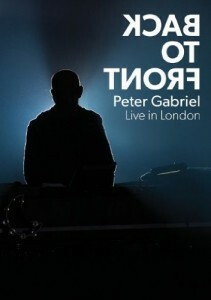 The deluxe Blu-ray (or DVD) comes with two CDs of the complete Back to Front show, which includes the first ever complete live performance of the So album and a bonus Blu-ray (or DVD) which offers the 93 min theatrical version of the Back to Front concert film (showing in selected cinemas at the moment) which has some significant differences to the home video edit, including montage versions of Solsbury Hill and Sledgehammer featuring footage from live shows across the years as well as additional interviews. The deluxe versions have 258 minutes of video content, while the standard versions have 142 minutes of video. Both have either DTS-HD High Res Audio or Dolby Digital/DTS depending on whether you opt for Blu-ray or DVD. Amongst the bonus features will be The Visual Approach a behind-the-scenes featurette on how they put the Back to Front live show together. 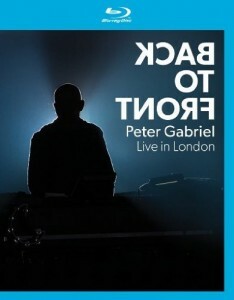 Back to Front: Live in London is released on 23 June 2014. I can’t believe that this is only £26 on Amazon at the moment. Presumably it cost a fortune to film. So how come a rehashing of the 40-year-old Rainbow film with one less CD is going to cost Queen fans £100? As usual, I just don’t get this. The “Deluxe Edition” runs $50.00 to pick up a double blu ray and a double CD. The Blu Ray single disc of the show runs $13.88. As I mentioned above, for those of us who saw the North America tour, the show specific recording through the encore series was a terribly modest and reasonable $14.99 and sounds half way decent. I love PG, but… enough. Saw the show in Detroit and bought the double CD of the show for $14.99. It was a great concert but I really don’t know if I need to add the new offerings. I assume the DVD/ Blu Ray are not all region ? £31 for the DVD deluxe edition – sounds a fair price myself compared to many others. I was hoping this release would come out quickly and it did :-). 33€ for us in Germany and to be honest, it’s a lot cheaper then I have expected. As Rob Puricelli mentioned before, it’s a damn fair price (don’t think there is much difference between pound or euro, correct me if I’m wrong). If some people however complain about the price, think about WHY we buy it… After all, we are paying partially for art :-). You can spend your 33 bucks on movies, food, magazines, tools, video games… but for crying out loud, for a Gabriel recording in this fashion it’s too much? That’s a feature of every PG live release unfortunately, going back to 1983s “Plays Live”. The ‘updates’ to the Genesis ‘Archive’ live sets are legendary… and very noticeable to me and many others. I’ll buy this, as I enjoyed some of the Youtube clips I’ve seen and it’s the original musicians playing some of my favourite music. As for the release of new music… I gave up on the prospect of that a long time ago. We know it’s there but I’ve basically given up. My blu-ray version arrived today and yes, it’s very obviously full of overdubs, especially on the vocals. I mean – cover albums, orchestral re-workings, big blue doodles, live albums…isn’t PG ever going to do another album of NEW material ? lol, it’s “The Tower That Ate People”. I was 10th row for the Toronto show, it was amazing…was really hoping PG might do a Blu-ray release of this incredible tour. I have the 2CD set that “The Music” did of the show I was at, so likely just the standard Blu-ray set for me unless the deluxe edition hits sub-$50 at some point. Fantastic news, hopefully it was multitracked like the Athens 1987 show was, the audio on that Blu-ray is incredible. Pre-order single blu-ray. I think that’s enough. I don’t need 2 cd from the show. Simple Minds do the same with Live from Hydro concert. They charged £50 for 2DVD + 2CD. I think it’s too expensive for most fans. Postage + £33 for this deluxe editions is also too much. Sorry Marko, and with all due respect, how is £33 too much for 2x Blu Rays, 2x CDs and a 60 page book?? 2 versions of a superb live concert (I know it was good as I was there), one of which is the theatrical release that has some unique moments (won’t let slip any spoilers) and the entire concert on 2x audio CDs, mixed under Peter’s supervision by his own in-house team, taken straight from the desk. And, ignoring the book and packaging, £8 per disc is too much? Nope, sorry, I just don’t understand how you can think that. Was track 20 really renamed “The Tower Ate the People,” or is that a misprint? Not a misprint. That is a truly fantastic song from OVO.